With yarn. Shocking, I know. I just had to gush about my recent purchase that came in the mail today. Just look at at! Have you ever seen anything so beautiful? I bought it from TheyToldMeSew at her Etsy shop. 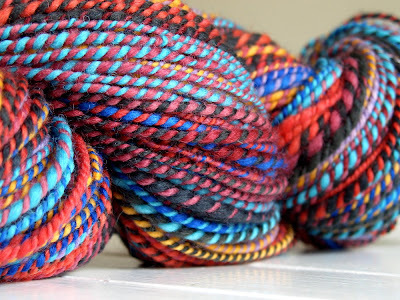 It is roughly 215 yards of handspun delicious in a heavy worsted/bulky weight. 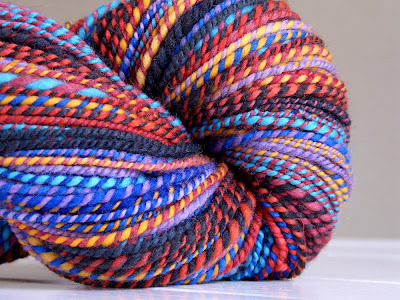 I have never felt yarn like this, and it is wonderful. 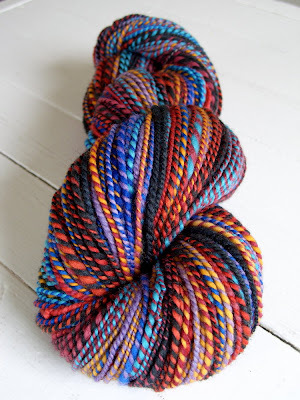 I wouldn't classify this yarn as being soft and squooshy, but it is definitely a sturdy feeling yarn and I hesitate to say stiff, but it feels like it has a lot of substance, if that makes sense. I am very pleased with it. Now all I have to do is think of something to make with it. 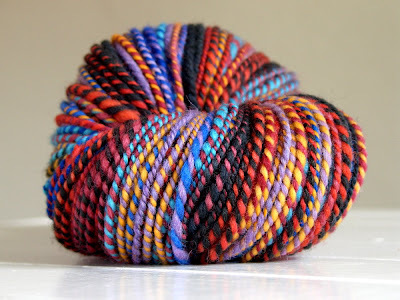 What does one make with yarn that looks like this anyway? Until I figure that out, it will just have to be on display. My first piece of art! Gosh. This looks wonderful! At first I thought you had spun it up!